There seems to be an awful lot going on this week, we are going to do a Bits & Bytes style post in order to at least share a bullet point or two. We begin with the continuing drama regarding Greek life at Princeton: University President Shirly Tilghman has announced a ban on freshman joining sororities and fraternities. Additionally, freshman will not be allowed to participate in rush. Here is a portion of the letter explaining some of the reasoning behind the decision. In some cases, they place an excessive emphasis on alcohol and engage in activities that encourage excessive and high-risk drinking. A major concern is that they select their members early in freshman year, when students are most vulnerable to pressures from peers to drink, and before they have had a full opportunity to explore a variety of interests and develop a diverse set of friendships. For those unfamiliar with the situation in Princeton, Greek organizations have never been officially recognized by the University, but they have played a significant role for thousands of student since the 1800s. Forums and meetings and discussions were held to discuss proposed changes to the system, below you see one such gathering in May of this year. Not all students are pleased with the decision, below we share part of a guest editorial by Josh Miller in the Daily Princetonian. That is the worst part of this whole debacle. President Tilghman’s decision is hurting the members of the Greek community — no, the Princeton community — that are the most innocent. Banning rush will not encourage the reclusive elites to join the greater Princeton community. But people like me — from urban public high schools that rarely send students to the “Ivies” — who cannot sing, make horrible jokes and do not want to write more than they already do in writing seminar, are left with fewer options when they arrive on campus. One item of social interaction at this particular Ivy, the school’s eating clubs; students join a specific club and eat there daily, dining is not done in a dorm and the school feels this offers a level of interaction and camaraderie. Here is more on the ban from the Alumni Weekly. A greater concern, however, is that fraternities and sororities have been associated with dangerous and demeaning hazing rituals and “irresponsible, excessive, dangerous, and in some cases, coerced” alcohol consumption, the report said. This isn’t the first University to ban Greek activities on campus, far from it, there are hundreds of tales on the topic, our Twitter friend Girl Tuesday shared a link to a 1994 story in the Times about a Greek ban at Middlebury. This is not meant to be any kind of definitive take on the topic, but so many of our readers enjoyed sorority and fraternity activities when in school it merited a mention. Show up early, bright-eyed and bushy tailed wearing your cutest team-themed sundress, know the basic rules of the game and honey, you’ll do just fine. The book may be purchased here for $24.99. For those interested in learning more there is a Gridron Belles Facebook page, Twitter feed, Flickr photo pages and more. As fall draws closer we thought doing a little Pretty in Pink would be a nice diversion. We start with the good folks at Boden, both the Favorite Cardigan in Painterly Pink ($44) or the Spotted Cardigan in Pink and Plum look snuggly and fun. By the way, the latter is 100% wool ($88). ideal for crisp autumn nights. The Young Miss at your palace might enjoy the pink and green Ribbed Tights 2-Pack ($24), or the Pink Wallpaper Backpack ($40), also at Boden. Not for the shy and retiring young lady, DC’s Pure Skate shoe ($35-45 ), the Tsukihoshi Euro Fashion Sneaker ($56) is also very pink, both are at Endless.com. 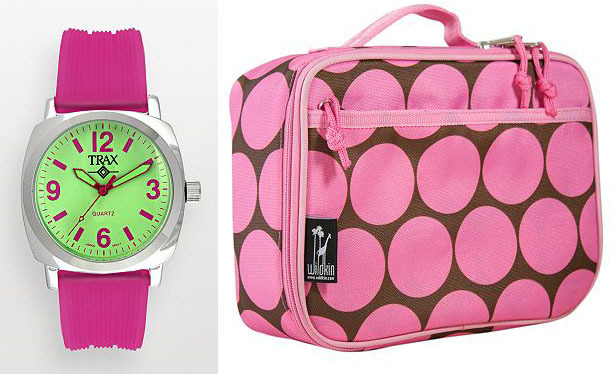 If thinking of something smaller for the grownup girls, the Trax Shelley watch ($40) at Kohl’s is an option, the Big Dots Lunch Box ($21) works for any age. There is always the Pink Princess phone (49.95) (if only to show the younger set what it was like in the “olden days”), or the more contemporary Digital Camcorder ($129.95), both at Kohl’s. If the Pretty in Pink Fairy wanted to sprinkle some pixie dust around the Prepatorium this would be a nice addition. That is the Malerie jacket ($495) by Kate Spade. Nor would we turn up our nose at the Cherie coat ($695) or the Bardot Sweater Dress ($355). Sigh. It really is a marvelous collection of interior design fabrics, filled with the joie de vivre and vibrancy one would associate with a Lilly fabric line. Who recently popped into her local C. Orrico to see the fabric with her very own eyes? That is Lilly with Lee Jofa rep Chris Zitelli, up above. Below we see her with some of the textiles, the C. Orrico staff and Mr. Zitelli. Does Lilly have any favorite fabrics from the collection? It turns out she does,the design is fond of Heritage Floral in the pink/salmon colorway and In a Twist. For those who haven’t seen the look book, click here. If interested in viewing the entire collection, click here to visit Lee Jofa online. Hello-Hello, and welcome to the party! It all began with this post way back on February 10, 2008. Those first fifteen posts were on Blogger, but within weeks we switched to WordPress, a format we thought would be more reader- and user-friendly. We have been blessed to chat with our cherished readers about all manner of things, primarily preppy styles and lifestyles, as well as persons and entities earning a place on the Anti-Prep Wall of Shame (Parents, please, shield impressionable young minds from this horror). Never mind that we can never figure out precisely how we spell Anti-Prep, Anti Prep, AntiPrep, one word or two? Hyphenated or no? And heaven knows we have posted on scads of other topics as well. This week we shall dedicate a little time to sharing what have been the most popular posts, the most frequently searched terms that lead people here, and links you have clicked on more than any others. Some things are more conspicuous by their absence (ahem, one specific retailer), and others are eyebrow-raising. We wonder if anyone will be able to guess the single most popular post…. any ideas? We shall share more tomorrow, until then we are off with a goofy grin and immense gratitude for the lessons learned and the friends we have made. You truly are better than the best. We leave you with a special Pretty in Pink the Consort created and a silly Princess smile. Hello-Hello and welcome to a bright and sunny springtime Tuesday! We are brief in this post; today’s volunteer obligations combined with losing yesterday to a migraine make for an intense schedule, eek! We begin with a follow-up to our post advancing the LL Bean Signature launch. For a bit of preppy heritage, T Magazine’s blog has a quick look at the new Lacoste book from Assouline. Although we previously mentioned the book on our FB Fan Page, we neglected to include it here on the blog, oops. The book is now available and one that is on our reading list. WWD (Women’s Wear Daily, subscription required) has a story on accessories for this fall; once again, we are clearly going to be out of step. So to speak. On the left, a style by Nicholas Kirkwood, the shoe on the right is from Bruno Frisoni. 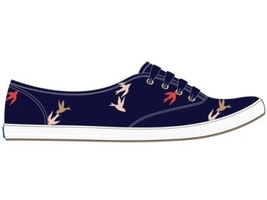 We are probably better off with styles along these lines, seen in “The Preppy Collaborations Continue: Keds x Gap“. The shoes seen above are from the collection Keds has done exclusively for the Gap, due out this summer. On another fun note, perhaps we shouldn’t be surprised, but there is some serious pink at the Keds online shop! The Champion Jute is for adults, while the Melody Hearts are for toddlers. We leave you with another Pretty in Pink, something The Consort discovered over at Design Boom. Meet Barbie Foot from French designer Chloe Ruchon. Until next time, we hope your skies are bright and sunny! Magic Knickers & Bingo Wings-Who Knew? Hello-Hello and welcome to a Thursday here at the Prepatorium! Our friends at the Telegraph have a stellar piece on avoiding Red Carpet disasters. Oooh, we had forgotten how unfortunate that garment was on Ms. Paltrow. 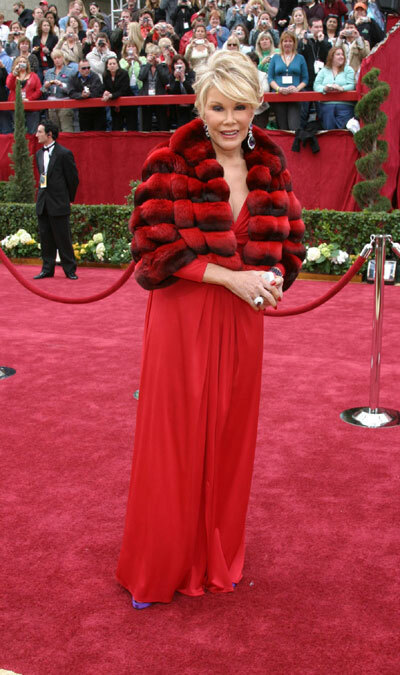 Next, a fire engine red fashion faux pas. Another term we hadn’t previously heard: “Bingo Wings”. With a little tulle or chiffon “shrug”. It’s a Dame Helen Mirren style secret and your “bingo wings” will remain yours. We’re thinking this is the sort of accessory discussed in Rule #5. 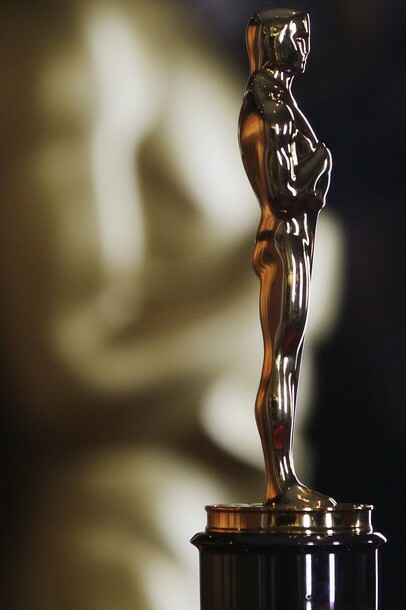 The Academy Awards offers an audience many advertisers covet; Penney’s is taking advantage of this, launching a new image campaign. The retailer is also using the broadcast to officially kickoff OlsenBoye, the line from the Olsen twins. Click here for a previous post with more on the collection. We close with an early look at the Liberty of London for Target line, due in stores and online March 14. The retailer has a splendid interactive feature online showcasing Liberty prints, anyone can pick a pattern and download it for use as a screensaver or desktop wallpaper. Here are a few more images from the always-on-top-of-all-things-fashion Catwalk Queen. In this next image we see pieces from the home collection including a lamp, bedding and candles. We could be mistaken, but we recall reading that some items, like the gardening tools, are only going to be available online. We think the Queen Mother might find the gloves appealing. We’ll make the planter today’s Pretty in Pink. At only $9.99 it’s also pretty nice on the pocketbook. Another item on its way to your local Targét, a Liberty print bicycle. As an FYI, the colors are much richer (and in many cases brighter) than our images show. Having returned less than an hour ago from a little jaunt to our local Target, we can report that banners promoting the line are in place all over the store. The collection includes products in every category, from clothing to accessories to home goods, it is a very important launch for one of our favorite places. Hello-Hello, did everyone manage to rest and rejuvenate this weekend? We hope so, this first week in February can be ever-so-dreary. We begin with a look at the new Narciso Rodriguez line to be sold on eBay. That is not a typo or our Newzheimers kicking in, the designer really is opening an eBay store. Some may recall initial news about the line when we originally mentioned it in September of last year. The acclaimed designer is collaborating with eBay on a small collection, only eight pieces in total. Here are a few more of George Chinsee’s photos from WWD’s story. The Rodriguez eBay store is slated to open February 15. We take a very quick look at a category we rarely venture into, ladies’ unmentionables. (Gasp!) Some experts believe the lingerie market is bouncing back along with many other retail sectors. Above, Tommy Hilfiger’s cotton flannel sleepshirt and microfiber bra/undies for next fall, below, a DKNY sleepwear look for fall/winter. The DKNY could easily be today’s Pretty in Pink. We move on to a topic many readers are already familiar with, the upcoming release of Disney’s Alice in Wonderland. The marketing bonanza tied into the movie is well underway, today we have a glance at several pieces by designer Tom Binns, beginning with his Shattered Teacups necklace. We found these images at High Snobette, the site has scads of photos from the line. Next, what we’re calling the “Off With Their Heads” necklace. Below, an amazing charm bracelet by Mr. Binns. The film opens March 5. Another PIP (Pretty in Pink) to ponder, the first in a series of new ads from Saks Fifth Avenue. We close with one more Pretty in Pink item, the Handbag Charm from Tiffany. Frequent readers may recall our attachment to charms, whatever their composition, and this one is no exception. With that, we say adieu until next time! But before that gets underway, a few morsels of info and lots of pictures to kick-start things before our Christmas break. 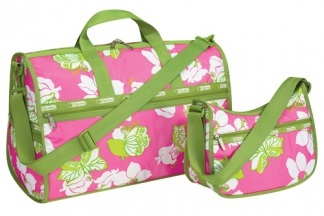 We begin with an early look at the Lilly Pulitzer for LeSportsac collection, compliments of the folks at M.I.S.S. & JuxtaPoz. As previous posts described, the Collection pops with bright colors and the inimitable Lilly style. Some readers may recall this line is part of the Lilly Loves Green initiative; some proceeds will go to the World Wildlife Federation. Our favorite pattern is probably going to be the green and white Hip Hop Hooray (L), although we like the blue and coral in Purrr-fect Patch as well. Purrr-fect Patch is slated to hit LeSportsac and Lilly stores in March, with She’s A Piston (shown below) scheduled for an April launch. This design is so fun we’re making it today’s Pretty in Pink. Also donating funds to a good cause, Lacoste. The company plans to give $500,000 to help preserve the Gange gharial crocodile; above, Michael Lacoste is seen holding one of these. As this story in WWD explains, the Gange gharial is known for “…its long, slender mouth with fully visible teeth.” Perfect for this brand! Women’s Wear Daily also reported this week that Lacoste plans to expand its shoe offerings for childrens and juniors, including infants; good news, unless perhaps one is a parent responsible for putting said footwear on those little feet. We also have word of several more celebrity perfumes in the works. Because there are not enough on the market. Holiday activities around the world are always fun to see, especially when they involve royalty. (The real kind.) Below, Princess Caroline of Hanover and her daughter, Princess Alexandra, head to the annual Christmas tree lighting in Monaco. Gifts are handed out to Monegasque children at the ceremony. 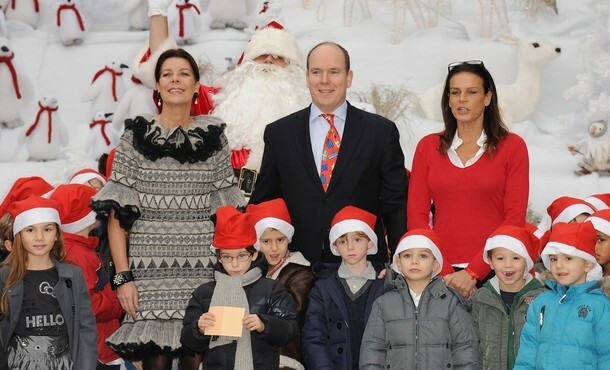 The next photo features Princess Caroline of Hanover Prince Albert II, and Princess Stephanie. 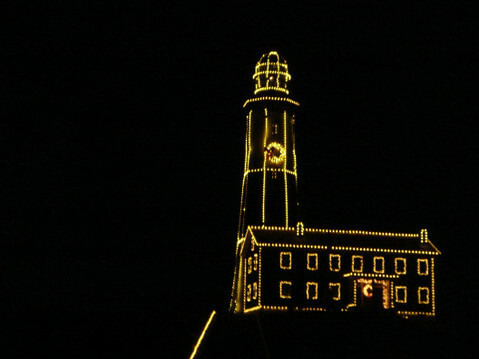 We leave you a look at Montauk Light, also dressed to celebrate the season. EDITOR’S NOTE: In case you miss it, Kim at M.I.S.S. was good enough to leave a comment indicating Hip Hop Hooray is not being produced. So much for our favorite pattern! And our thanks to Kim for the info! Hello-Hello and welcome to the mayhem that is the Prepatorium today, in large part because yesterday we were a tad under the weather. We thank The Consort for stepping in and penning the blog, what a dream of a spouse he is! We are so woefully behind in personal and professional obligations we fear our pointy little head is about to explode! Therefore our bloggage will be brief. We begin with a sneak peek at a line from a designer we adore, Isaac Mizrahi, for a television shopping channel we had never visited, QVC. It seems the talented designer is using many of the classic design lines he employed at Le Boutique Targèt. Above: the Wool blend duffle toggle coat, $198; cashmere sweater, $88, and taffeta skirt, $60; shoes, $70. We aren’t crazy about this next look; the word ‘matronly’ comes to mind, oui? We’ll use this next item as today’s Pretty in Pink; the leather Drawstring Bag is expected to be $200. The Patent Leather clutches are going to be in the $75 range. Mr. Mizrahi’s collection is also going to include housewares. Below left, the set of Three Vases are going to retail at $75 (the candy dish price isn’t available) and the Bow Plates will be $40 for a set of four. The talented designer is also going to offer a wide variety of tartan products, including the Cotton Pajama Set, $67, and the Plaid Throw, $49. A new and nifty option for storage? The Tartan plaid boxes in two sizes at $55 and $70. Yes indeedy, that is an edible tartan: the cheesecake will be offered at $40, and the plaid platter at $40. Yumalicious! Below, Mr. Mizrahi and a model in his Gold paillette tank and silk pants. Target still hasn’t ‘replaced’ Mr. Mizrahi as far as we are concerned, they have yet to procure a stellar talent as an in-house designer, although they claim to be content with the status quo in this respect. The collection launches on QVC December 4 – we may actually tune in for the unveiling. A few quick Sales & Savings opportunities we must pass along, the first already underway…. The Kate Spade Sample sale is generally worth a visit, with things like the Bon Vivant zippered Chrissy only $81. An upcoming chance to enhance one’s walk-in starts Thursday (the 12th), this one courtesy of the good folks at Lilly. This is the first time Lilly Pulitzer is doing an online-only sale; if interested in being able to get a head start on shopping, Lilly Facebook fans will be able to start browsing and buying at 7am Thursday. Those who subscribe to the Lilly newsletter may begin at 8am, and the sale opens to ‘regular shoppers’ online at 9am. It seems the success of the online sale might have a direct impact on what is available at the Lilly Warehouse Sale next week, the 19th – 21st. Finally, we are struggling in our efforts to adapt to life without our dear friends Don and Betty Draper Mad Men every Sunday evening. Below, Jon Hamm and January Jones on the set. A season that started with such promise ends with the couple having “the talk” with their children. We shall have to wait until next season to learn about the family’s future, including how little Bobby and Sally Draper handle Daddy’s absence from the family hearth. Sigh. For those fond of Ms. Jones, she is hosting Saturday Night Live this weekend. On that note we say g’bye until next time!